Yes, I have to admit our garage is a treasure trove of old junk. I’m sure I’m not the only one (o.k., maybe I’ve got more than most)! 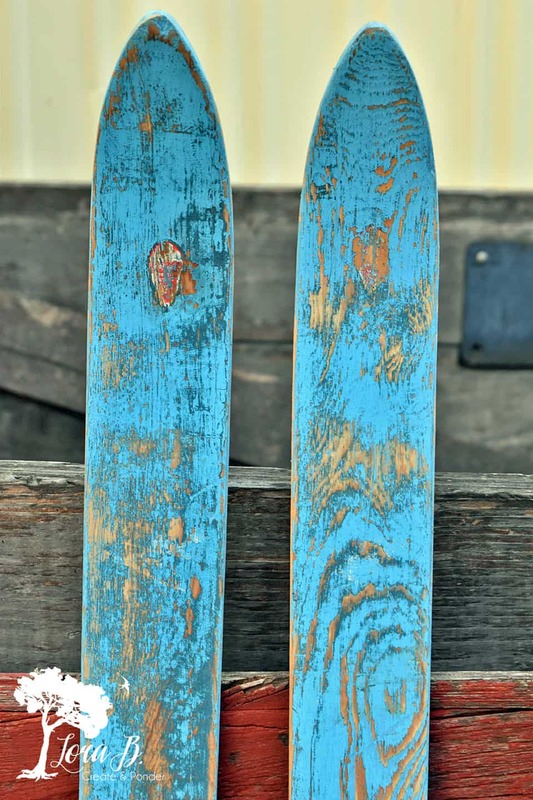 This pair of old, wooden blue skis has been hanging around since my brother-in-law sent them my way, knowing I was a fan of anything with a history. 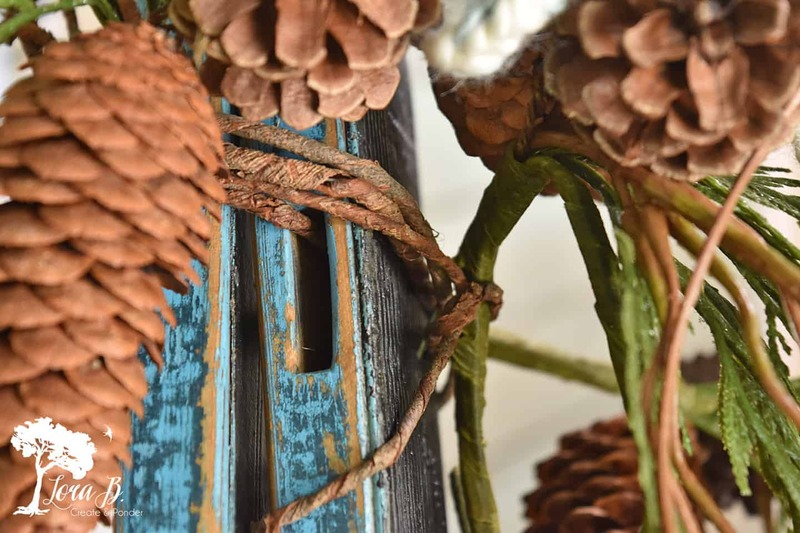 I’ve hung them on the house as winter decor previous years, but had never realized their full potential until I attacked them with the sander. 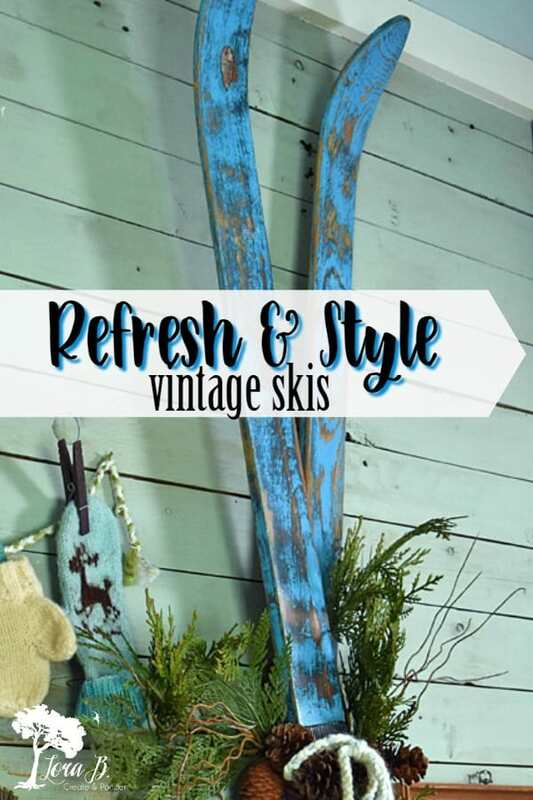 Let me show you How To Refresh and Style Vintage Skis! 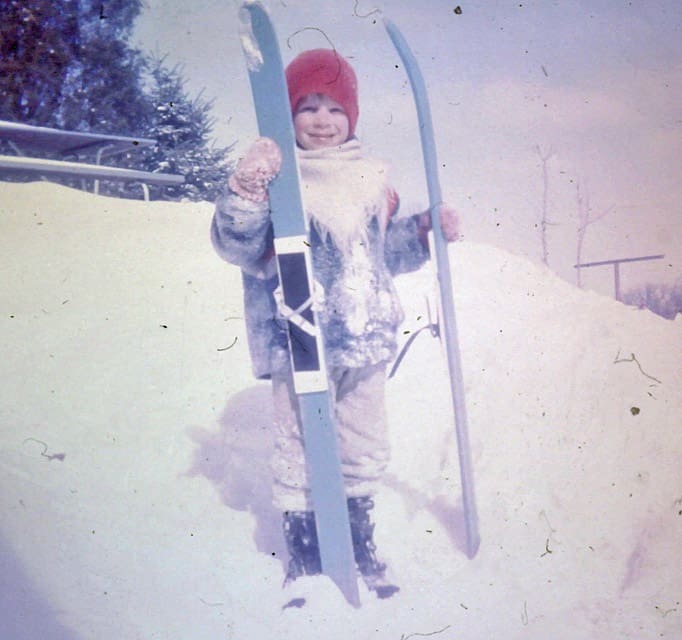 For a little throwback…that’s my husband in the 70’s enjoying the freshly painted blue skis! 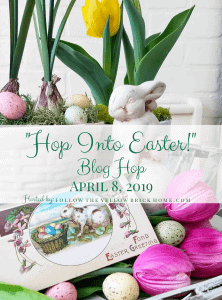 As I explained in my post, “Decorating Status Quo Syndrome”, sometimes the items we’ve looked at the longest have the biggest potential, but we’ve unfortunately stopped even seeing them! These skis that had been kicked around the garage for years definitely fit into that category! There’s nothing I like better than a bad paint job! 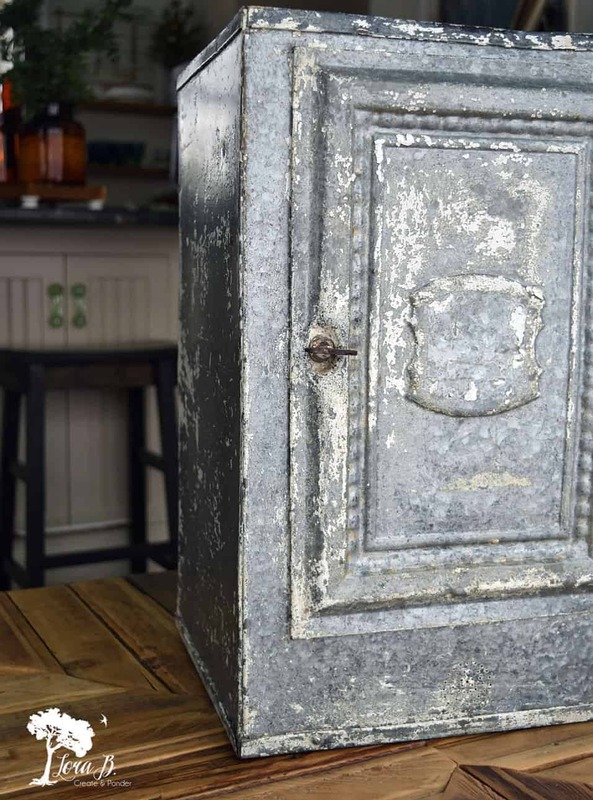 And when a little bit of sanding reveals hidden treasure…even better! I loved finding an old, red label! Unfortunately I was a little too aggressive with my sanding before I lost one:( Even die-hard restorers make mistakes sometimes. I finished off the beautiful, time-worn character with a couple coats of poly to seal and bring out the vibrancy. Luckily these old skis usually have a space hollowed out where the bindings or ropes were. 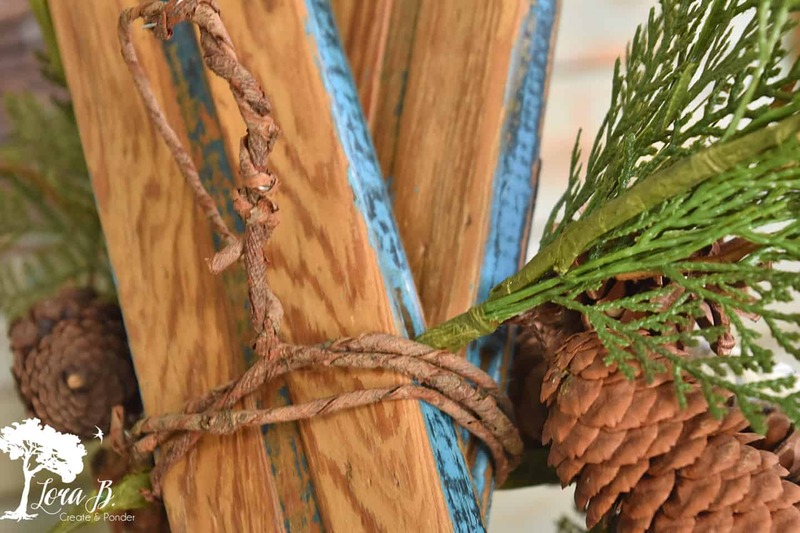 To hang, simply weave some bark-covered wire or something similar through the skis, wrapping each one to develop an “X”. Create a loop in the back. Stick some greens in the holes too. 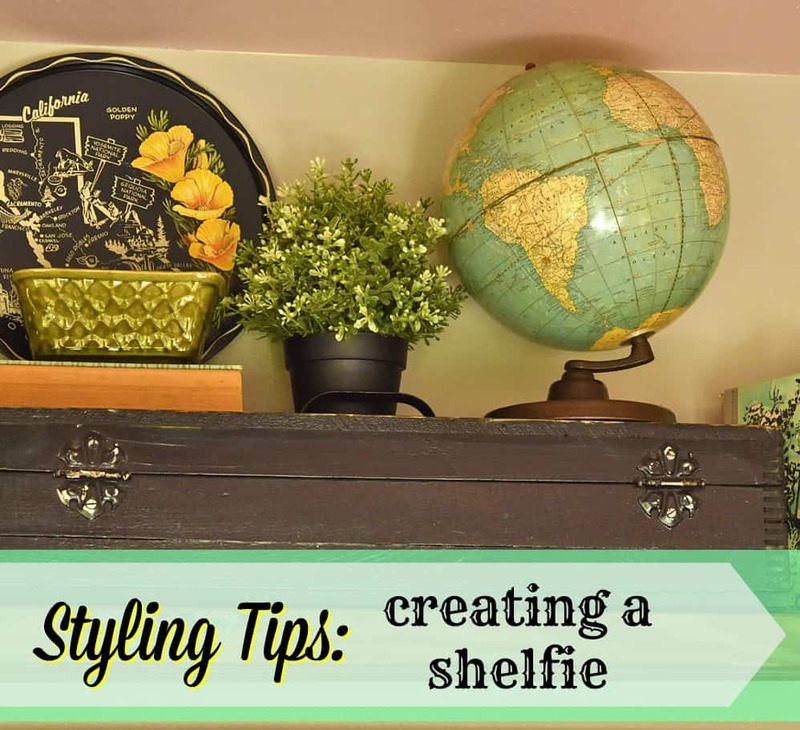 You could also tie a scarf around for some extra texture. 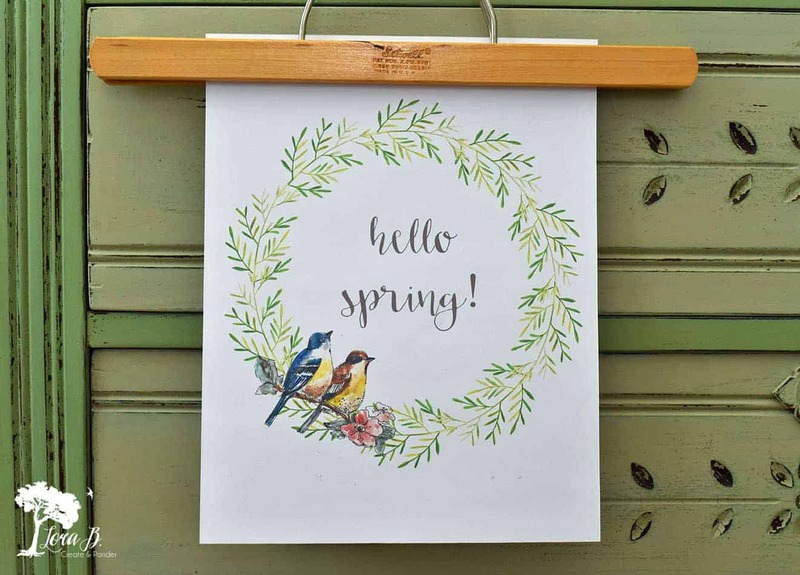 Hang them on your wall with other winter-time items. I used them for our back entry. Instead of ribbon, braid lengths of yarn, knotting each end. 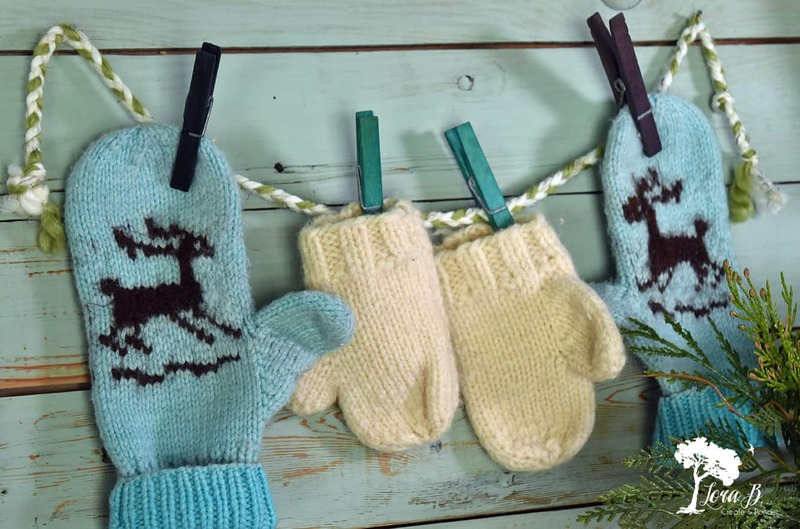 Create a clothesline for your mittens, clipping them with some “RIT Dyed Clothespins” in your favorite colors. 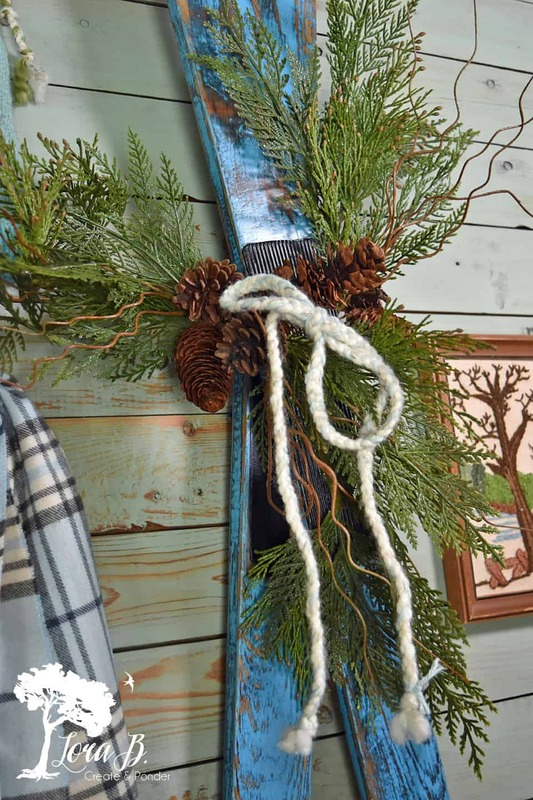 I put a bow of braided yarn on the skis also. I picked up the vintage deer mittens years ago while working at an antique mall (I think I spent more than I made on my booth, unfortunately). The cream child’s pair was lovingly knitted by my grandma for one of my kiddos when they were little. 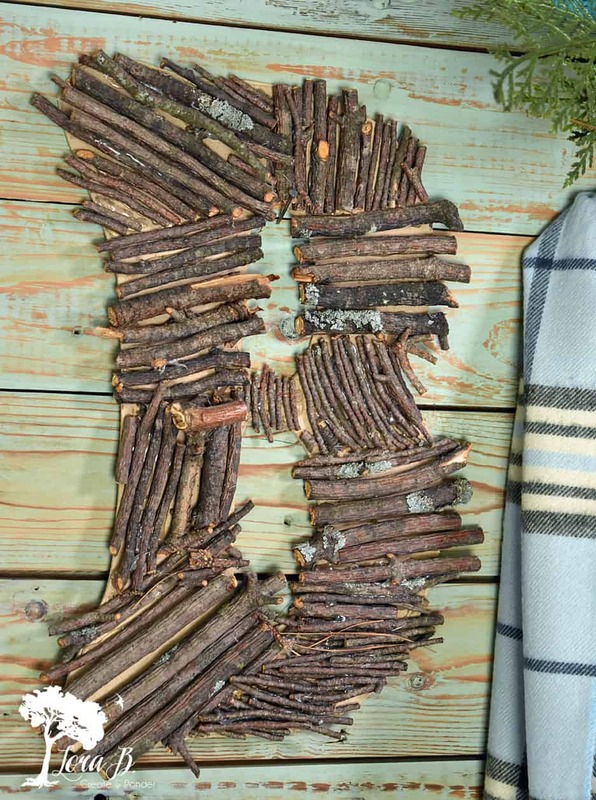 To add some entryway personalization, hot glue some sticks from the yard to a cardboard cut-out of your initial. Easy and cheap! 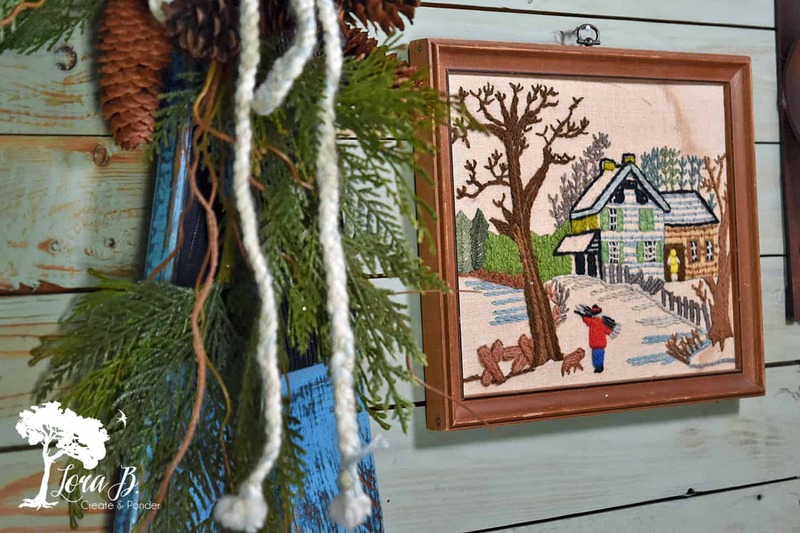 And to pull it all together, I added a Currier and Ives needlepoint frame I picked up somewhere. I love the yarny texture of needlepoint in the winter. I really should take the fabric out and wash it, and paint the frame white…details, details. It works as is, right? Rescuing these vintage, wooden skis from the garage and elevating their worth was simple and fun! They’ve got family history and great character. They will definitely be more appreciated than they have been in a long time! 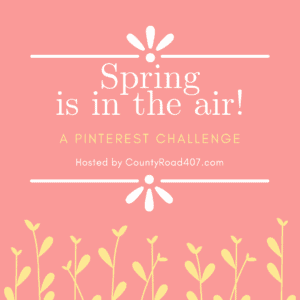 Do you have any items laying around you could refresh and enjoy more than you have been? Have you come across pairs of vintage skis in your treasure hunting? 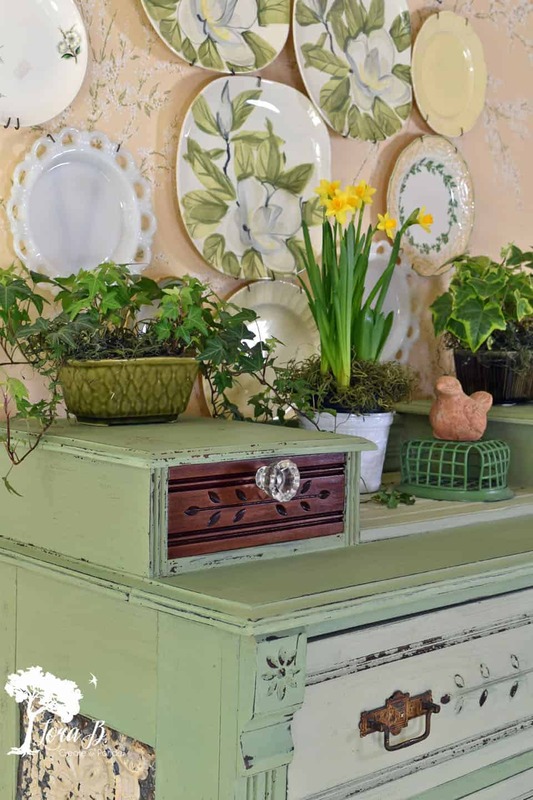 Maybe you sell vintage and these tips encouraged you to pop some in your winter-themed booth. 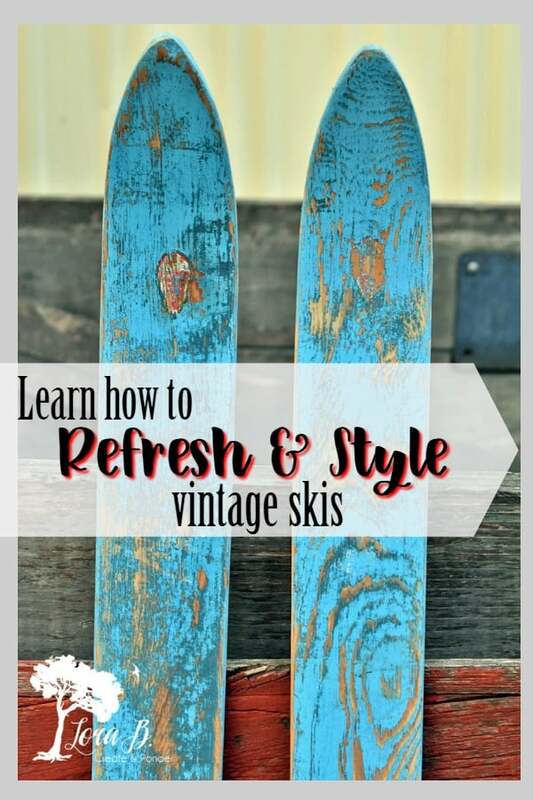 I just hope I convinced you these vintage skis have enduring charm, and this How to Refresh and Style Vintage Skis tutorial helped you! 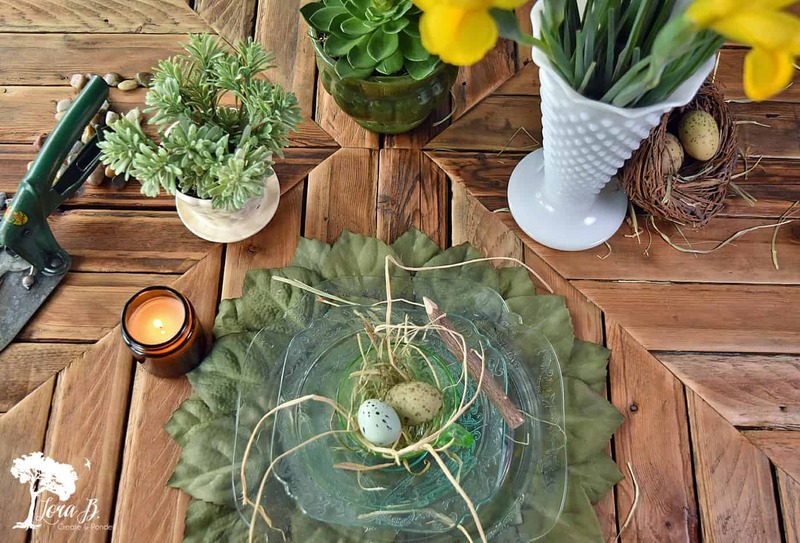 Beautiful job and love the way you decorated with them! Thanks for sharing at our link party! Your welcome, Stephanie! Glad you enjoyed it! I love these Lora! 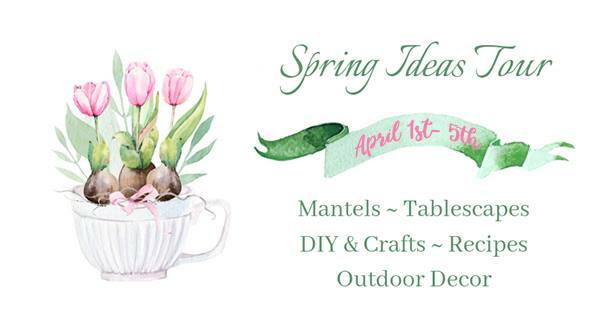 I love the whole little vignette… from the little mittens to the embroidery piece! Thanks, Linda. I kind of liked them before, but wow-they are so much cooler now!